JK 4-Dr Crusher Corners LED Tail and Backup Lights for Jeep Wrangler JK 2007-2016. Poison Spyder Crusher Corners for the JK provide ultimate protection for the vulnerable rear corners of your Jeep JK. Crusher Corners are Full-corner protectors, extending from the rear tailgate, around the side, over the wheel openings and all the way to the door openings. 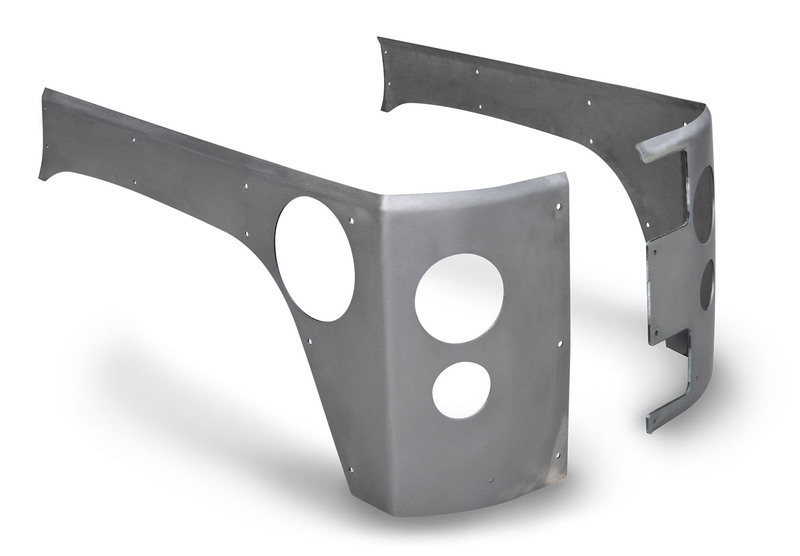 Made of rugged 1/8 inch steel, JK Crusher Corners may be used with the Stock JK fender flares or with Poison Spyder JK Rear Crusher Flares for the ultimate combination of rear corner armor. Poison Spyder JK Crusher Corners are unique among aftermarket corner armor, in that they provide Full coverage while conforming to the compound curves and subtle contours of the JK body lines. Competitor Full corner protectors are brake-formed from flat steel, and may require the removal of large swaths of the Stock sheet metal in order to install them. Poison Spyder Crusher Corners are tool-formed to match the JK body lines in a close-fitting overlay, requiring no cutting of the body except to clearance for the flush-mount LED lights (on LED-ready versions). JK Crusher Corners come in a complete kit with stainless steel button head hardware. Drilling is required, as is installation of threaded nut-serts (Poison Spyder provides the nut-serts, a simple nut-sert installation tool and detailed instructions). JK Crusher Corners are shipped as bare steel. These Crusher Corners are designed to work with high intensity, low-profile, 4 inch round LED taillights [p/n 41-04-050 (red) or 41-04-051 (clear/red), sold separately] . These LED lights are brighter with less power draw than the OE taillights, and will last longer than the incandescent bulbs. Best of all, they are flush-mounted, barely protruding from the surface of the Crusher Corner, to better survive close encounters with rocks, trees and canyon walls that may knock off the bulky Stock taillight housings. These Crusher Corners are also cut to work with 2.5 inch round LED backup lights (p/n 41-04-300, sold separately). These cut-outs are made with a precision 5-axis laser in order to ensure a perfect fit. Note that LED taillights will require the installation of load resistors (p/n 41-04-650, sold separately) to provide the correct load resistance and keep the Jeep computer from thinking it has a taillight out, causing a faster flash rate. For the easiest installation of LED taillights and backup lights, use Poison Spyder plug and play, all-inclusive JK LED Tail and Reverse Light Wiring Kit (p/n 41-08-010, sold separately). There are different Crusher Corners available that are designed to accept just the LED Taillights (p/n 18-05-020), or to retain the Stock OE taillights (p/n 18-05-022, or Blank (no taillight cut-outs, p/n 18-05-024).